This article is about the Globe Theatre of Shakespeare. For the more modern reconstruction in London, see Shakespeare's Globe. For other uses, see Globe Theatre (disambiguation). A modern reconstruction of the Globe, named "Shakespeare's Globe", opened in 1997 approximately 750 feet (230 m) from the site of the original theatre. From 1909, the current Gielgud Theatre was called "Globe Theatre", until it was renamed (in honour of John Gielgud) in 1994. Examination of old property records has identified the plot of land occupied by the Globe as extending from the west side of modern-day Southwark Bridge Road eastwards as far as Porter Street and from Park Street southwards as far as the back of Gatehouse Square. 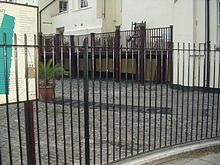 However, the precise location of the building remained unknown until a small part of the foundations, including one original pier base, was discovered in 1989 by the Department of Greater London Archaeology (now Museum of London Archaeology) beneath the car park at the rear of Anchor Terrace on Park Street. The shape of the foundations is now replicated on the surface. As the majority of the foundations lies beneath 67—70 Anchor Terrace, a listed building, no further excavations have been permitted. The Globe was owned by actors who were also shareholders in the Lord Chamberlain's Men. Two of the six Globe shareholders, Richard Burbage and his brother Cuthbert Burbage, owned double shares of the whole, or 25% each; the other four men, Shakespeare, John Heminges, Augustine Phillips, and Thomas Pope, owned a single share, or 12.5%. (Originally William Kempe was intended to be the seventh partner, but he sold out his share to the four minority sharers, leaving them with more than the originally planned 10%). These initial proportions changed over time as new sharers were added. Shakespeare's share diminished from 1/8 to 1/14, or roughly 7%, over the course of his career. The Globe was built in 1599 using timber from an earlier theatre, The Theatre, which had been built by Richard Burbage's father, James Burbage, in Shoreditch in 1576. The Burbages originally had a 21-year lease of the site on which the theatre was built but owned the building outright. However, the landlord, Giles Allen, claimed that the building had become his with the expiry of the lease. On 28 December 1598, while Allen was celebrating Christmas at his country home, carpenter Peter Street, supported by the players and their friends, dismantled The Theatre beam by beam and transported it to Street's waterfront warehouse near Bridewell. With the onset of more favourable weather in the following spring, the material was ferried over the Thames to reconstruct it as The Globe on some marshy gardens to the south of Maiden Lane, Southwark. While only a hundred yards from the congested shore of the Thames, the piece of land was situated close by an area of farmland and open fields. It was poorly drained and, notwithstanding its distance from the river, was liable to flooding at times of particularly high tide; a "wharf" (bank) of raised earth with timber revetments had to be created to carry the building above the flood level. 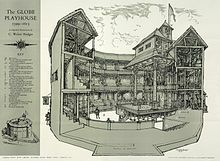 The new theatre was larger than the building it replaced, with the older timbers being reused as part of the new structure; the Globe was not merely the old Theatre newly set up at Bankside. It was probably completed by the summer of 1599, possibly in time for the opening production of Henry V and its famous reference to the performance crammed within a "wooden O". Dover Wilson, however, defers the opening date until September 1599, taking the "wooden O" reference to be disparaging and thus unlikely to be used in the Globe's inaugural staging. He suggests that a Swiss tourist's account of a performance of Julius Caesar witnessed on 21 September 1599 describes the more likely first production. The first performance for which a firm record remains was Jonson's Every Man out of His Humour—with its first scene welcoming the "gracious and kind spectators"—at the end of the year. On 29 June 1613, the Globe Theatre went up in flames during a performance of Henry VIII. A theatrical cannon, set off during the performance, misfired, igniting the wooden beams and thatching. According to one of the few surviving documents of the event, no one was hurt except a man whose burning breeches were put out with a bottle of ale. It was rebuilt in the following year. Like all the other theatres in London, the Globe was closed down by the Puritans in 1642. It was pulled down in 1644–45; the commonly cited document dating the act to 15 April 1644 has been identified as a probable forgery—to make room for tenements. A modern reconstruction of the theatre, named "Shakespeare's Globe", opened in 1997, with a production of Henry V. It is an academic approximation of the original design, based on available evidence of the 1599 and 1614 buildings, and is located approximately 750 feet (230 m) from the site of the original theatre. In February 2016, a temporary full-scale replica of the Second Globe Theatre, called the Pop-up Globe and based on scholarly reanalyses of the surviving evidence for the 1614 building, opened in downtown Auckland, New Zealand, and presented a three-month season of Shakespeare's plays performed by a house company and by visiting local production groups. It was reconstructed in a second Auckland location to host a three-month 2017 season. The Globe's actual dimensions are unknown, but its shape and size can be approximated from scholarly inquiry over the last two centuries. The evidence suggests that it was a three-storey, open-air amphitheatre approximately 100 feet (30 m) in diameter that could house up to 3,000 spectators. The Globe is shown as round on Wenceslas Hollar's sketch of the building, later incorporated into his etched Long View of London from Bankside in 1647. However, in 1988–89, the uncovering of a small part of the Globe's foundation suggested that it was a polygon of 20 sides. At the base of the stage, there was an area called the pit, (or, harking back to the old inn-yards, yard) where, for a penny, people (the "groundlings") would stand on the rush-strewn earthen floor to watch the performance. During the excavation of the Globe in 1989 a layer of nutshells was found, pressed into the dirt flooring so as to form a new surface layer. Vertically around the yard were three levels of stadium-style seats, which were more expensive than standing room. A rectangular stage platform, also known as an apron stage, thrust out into the middle of the open-air yard. The stage measured approximately 43 feet (13.1 m) in width, 27 feet (8.2 m) in depth and was raised about 5 feet (1.5 m) off the ground. On this stage, there was a trap door for use by performers to enter from the "cellarage" area beneath the stage. The back wall of the stage had two or three doors on the main level, with a curtained inner stage in the centre (although not all scholars agree about the existence of this supposed "inner below"), and a balcony above it. The doors entered into the "tiring house" (backstage area) where the actors dressed and awaited their entrances. The floors above may have been used as storage for costumes and props and management offices. The balcony housed the musicians and could also be used for scenes requiring an upper space, such as the balcony scene in Romeo and Juliet. Rush matting covered the stage, although this may only have been used if the setting of the play demanded it. Large columns on either side of the stage supported a roof over the rear portion of the stage. The ceiling under this roof was called the "heavens," and was painted with clouds and the sky. A trap door in the heavens enabled performers to descend using some form of rope and harness. The stage was set in the south-east corner of the building, so as to be in shade during afternoon performances in summer. The name of the Globe supposedly alludes to the Latin tag totus mundus agit histrionem, in turn derived from quod fere totus mundus exerceat histrionem—"because all the world is a playground"—from Petronius, which had wide circulation in England in the Burbages' time. Totus mundus agit histrionem was, according to this explanation, therefore adopted as the theatre's motto. Another allusion, familiar to the contemporary theatre-goer, would have been to Teatrum Mundi, a meditation by the twelfth-century classicist and philosopher John of Salisbury, in his Policraticus, book three. In either case, there would have been a familiar understanding of the classical derivation without the adoption of a formal motto. It seems likely that the link between the supposed motto and the Globe was made only later, originating with the industrious early Shakespeare biographer William Oldys, who claimed as his source a private manuscript to which he once had access. This was repeated in good faith by his literary executor George Steevens, but the tale is now thought "suspicious". ^ a b Cooper, Tarnya, ed. (2006). "A view from St Mary Overy, Southwark, looking towards Westminster, c.1638". Searching for Shakespeare. London: National Portrait Gallery. pp. 92–93. ISBN 978-0-300-11611-3. ^ Wilson, Ian (1993). Shakespeare the Evidence. London: Headline. xiii. ISBN 0-7472-0582-5. ^ Braines 1924, pp. 17–45. ^ a b McCudden 1990. ^ Stern, Tiffany (2010). "The Globe Theatre and the open-air amphitheatres". In Sanders, Julie. Ben Jonson in Context. Cambridge, England: Cambridge University Press. p. 113. ISBN 0-521-89571-5. ^ a b Wotton, Henry (2 July 1613). "Letters of Wotton". In Smith, Logan Pearsall. The Life and Letters of Sir Henry Wotton. Two. Oxford, England: Clarendon Press. pp. 32–33. ^ Awde, Nick. "Shakespeare's Other Home in the Southern Hemisphere". thestage.co.uk. Retrieved 21 November 2016. ^ "Pop-up Globe to rise in the gardens at Ellerslie Racecourse". Stuff. Fairfax NZ Ltd. 25 October 2016. Retrieved 3 May 2017. ^ Dekker, Thomas (1609), reprinted 1907, ISBN 0-7812-7199-1. The Gull’s Hornbook: "the stage...will bring you to most perfect light... though the scarecrows in the yard hoot at you". ^ from attiring—dressing: "tiring, n.3". Oxford English Dictionary (2 ed.). Oxford, England: Oxford University Press. 1989. ^ Egan, Gabriel (2015). "Lighting". In Wells, Stanley. The Oxford Companion to Shakespeare (2 ed.). Oxford University Press. ISBN 9780198708735. ^ Ingleby, Clement Mansfield; Toulmin Smith, Lucy; Furnival, Frederick (1909). Monro, John, ed. The Shakespere allusion-book : a collection of allusions to Shakespere from 1591 to 1700. 2. London: Chatto and Windus. p. 373. OCLC 603995070. ^ Stern, Tiffany (1997). "Was 'Totus mundus agit histrionem' ever the motto of the Globe Theatre?". Theatre Notebook. The Society for Theatre Research. 51 (3): 121. ISSN 0040-5523. ^ Egan, Gabriel (2001). "Globe theatre". In Dobson, Michael; Wells, Stanley. The Oxford Companion to Shakespeare. Oxford, England: Oxford University Press. p. 166. ISBN 978-0-19280614-7. Braines, William Westmoreland (1924). The Site of the Globe Playhouse, Southwark (2 ed.). London: Hodder and Stoughton. hdl:2027/uc1.b4507942. OCLC 3157657. OL 19680911M. Egan, Gabriel (1999). "Reconstructions of The Globe: A Retrospective" (PDF). Shakespeare Survey. Shakespeare Survey. 52 (1): 1–16. doi:10.1017/CCOL0521660742.001. ISBN 0-521-66074-2. Retrieved 25 July 2007. Egan, Gabriel (2004). "The 1599 Globe and its modern replica: Virtual Reality modelling of the archaeological and pictorial evidence". Early Modern Literary Studies. 13: 5.1–22. ISSN 1201-2459. Retrieved 25 July 2007. McCudden, Simon (Spring 1990). "The Discovery of the Globe Theatre" (PDF). London Archaeologist. 6 (6): 143–144. Orrell, John (1989). "Reconstructing Shakespeare's Globe". History Trails. University of Alberta. Retrieved 10 December 2007. Wikimedia Commons has media related to Globe Theatre, Southwark.